Medieval and modern leather belts. We have a wide selection of leather histrocial belts (viking and celtic belts) and country belts, and we also make luxurious belts for ladies and gentlemen with silver buckles and ornaments. We can make a custom leather belt: just choose your own combination of color, buckle and ornaments. We take great pride in the quality of the materials we use and our craftsmanship. Handmade LEATHER BELT WITH SPIRAL. Handmade DECORATED LEATHER BELT with Forged Buckle. 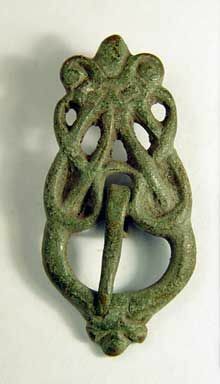 An Iron Age ladies belt with an iron forged buckle. A replica of a viking belt set. Inspired by a find from Norway, the 10th century, which was crafted in the Viking art style of "Borre". Roman Centurion Belt for reenactors. Import. A historical leather belt that is made of a high quality leather. Based on the Viking Age finds and the Viking art style. A viking leather belt that is made of a high quality leather. Based on the Viking Age finds and the Viking art style. The belt buckle is a replica of a find from Sweden, locality: Fröjel. TOP QUALITY Executive Leather BELT with our own Sterling SILVER Buckle. We can produce better quality leatherware than most established manufacturers. Our own crafted buckles. A leather medieval belt that is made of a high quality leather. ERCOLE, Business leather belt, brown. You will have your belt custom made in our leather worshop. A leather medieval belt that is made of a high quality leather. A casted historical buckle, the belt is decorated with stamping. A leather medieval belt that is made of a hish quality leather. A casted historical buckle, the belt is decorated with stamping.